Julia generously tagged me in the “J.Crew Challenge,” and sent me this lovely top to style. 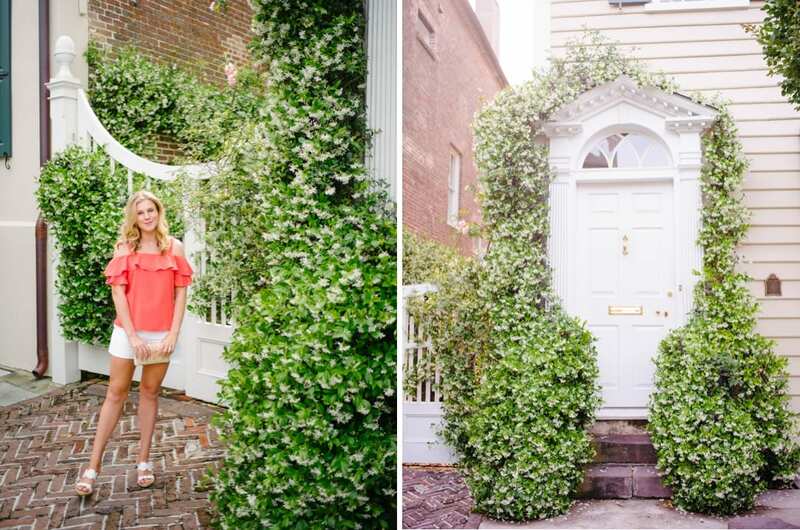 Amidst the beauty of Charleston’s spring, where white Confederate Jasmine is in full bloom, it was easy to show off the fun pop of color and graceful swing of this off-the-shoulder top in front of these fragrant blooms, spilling over the walls and gateways of my city’s historic downtown. 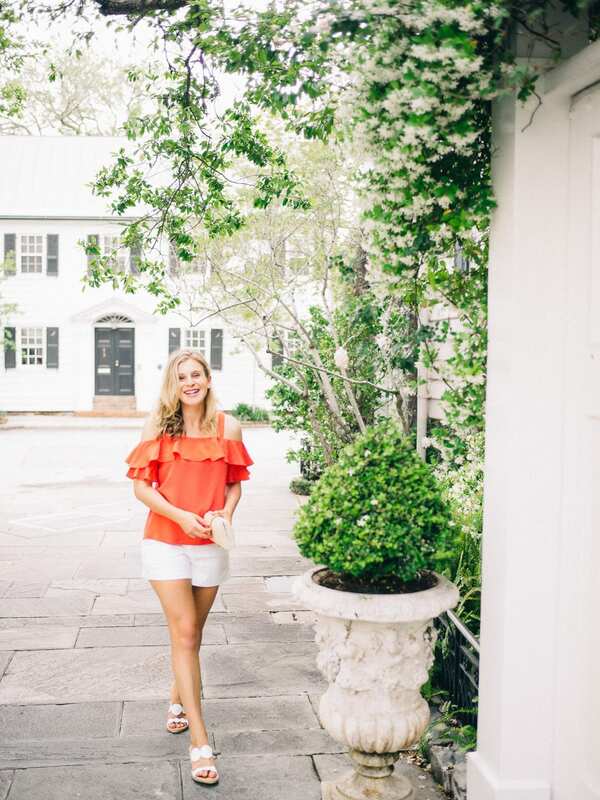 I also love JCrew’s rattan straw clutch (inspired by Julia’s love of wicker bags) and found it the perfect match for this spring top and their white ruffled cotton shorts. Hats off to J.Crew for infusing a simple “shorts and top” combination with an easy elegance that I can wear in the most sublime surroundings! 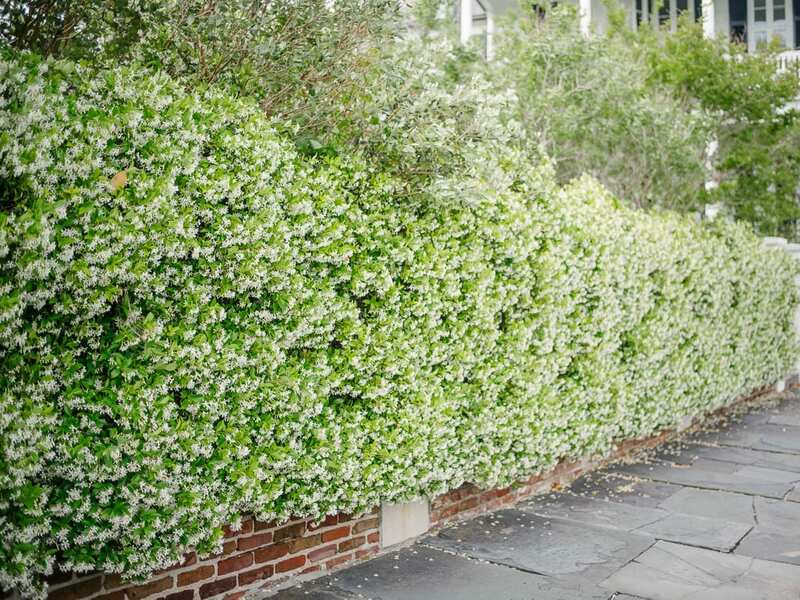 The beautiful jasmine scented driveway above leads into one of my all-time favorite houses in Charleston. 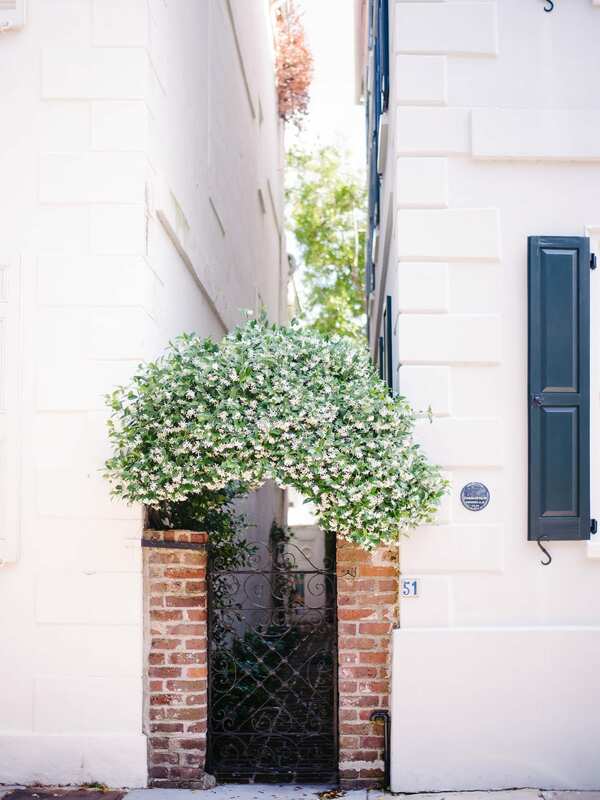 Church street is the perfect avenue of jasmine walls, gates, and driveways and is a must-see for any visitor to Charleston. 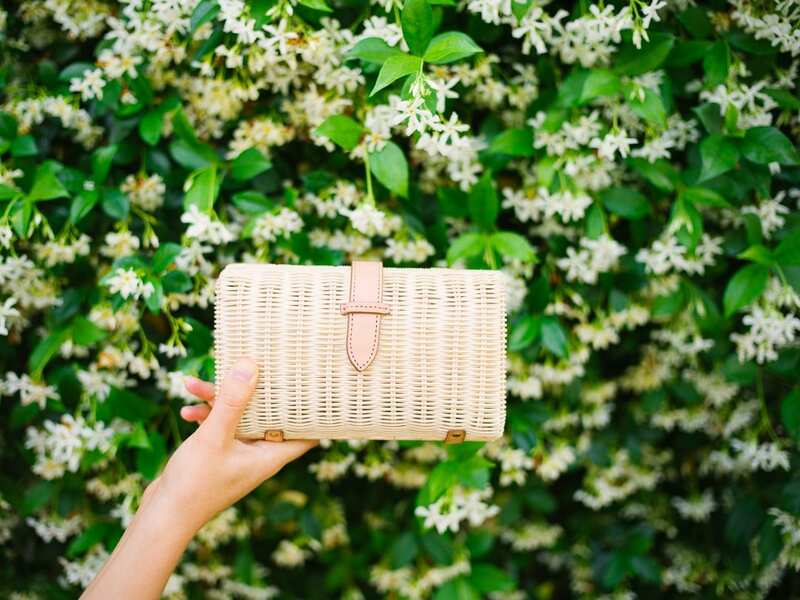 This perfect sized clutch will be a favorite bag of mine this summer. It is just the right size to squeeze in my iPhone 7+, a lipstick and sunglasses. I’m also very enthusiastic about my pink version that I can’t wait to take to the beach. Where does it all come from? 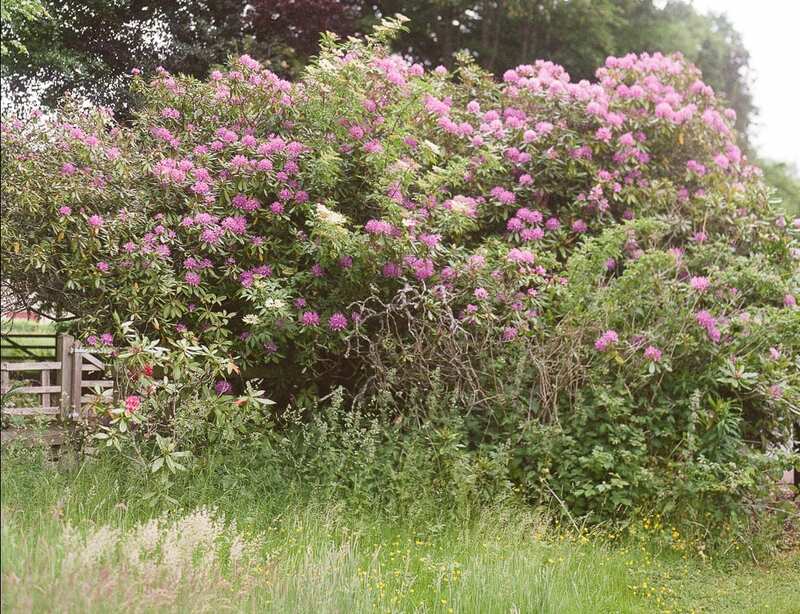 The abundance of the Jasmine makes it hard to see whether it grows from the ground or seems to explode effortlessly from the air… surrounding a lamppost, spilling through the gates, or creating a huge hug around a front door. It is truly spectacular! One of the most beautiful and happy making sights of all blooms — the scent is intoxicating! If you are visiting Charleston, this is an easy find and it is right along the battery.